The Auto Assignment Algorithm of Mnova, combines several software techniques we had developed in recent years as tools for expert tasks such as automatic detection and characterization of spectral peaks, automatic solvent detection and automatic structure verification. 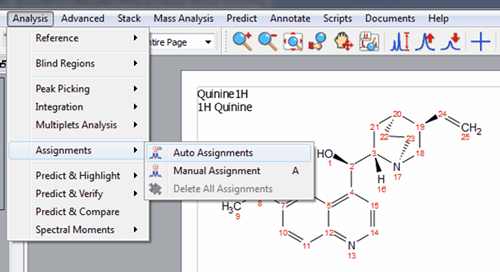 Please note that you need both Mnova NMR and Mnova NMRPredict Desktop in order to use Auto-Assignments. Mnova provides a very simple interface to automatically assign your molecule. 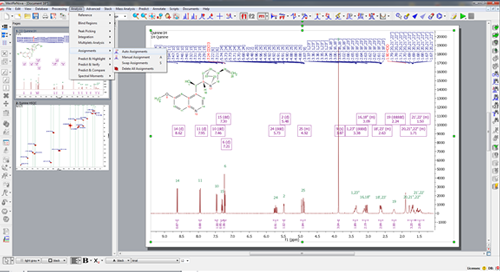 Just load your 1H-NMR spectrum with the applicable molecular structure and follow the menu ‘Analysis/Auto Assignments’. You can also load your HSQC dataset in the same document, to increase the quality of the assignments. Mnova will automatically run a multiplet analysis and will fully assign your spectrum with the applicable molecular structure. Multiplet’s boxes will be renamed with the corresponding atom number of the molecule and you will get an assignment label with the atom number over the applicable peak. In addition, hovering the mouse over the atom will highlight the applicable signal in the spectrum. Do not hesitate to contact us if you need any further piece of information.